A large etching by Menpes, of what was once one of the busiest stretches of the Thames, with cranes transferring goods from barges to dock-side. A print of this is held in the collection of the National Gallery of Australia (described as a, 'harbour scene with smokestack and crane'). Menpes' interest in the Thames is likely to have been prompted by the years he spent as a friend and 'pupil' of James McNeill Whistler. 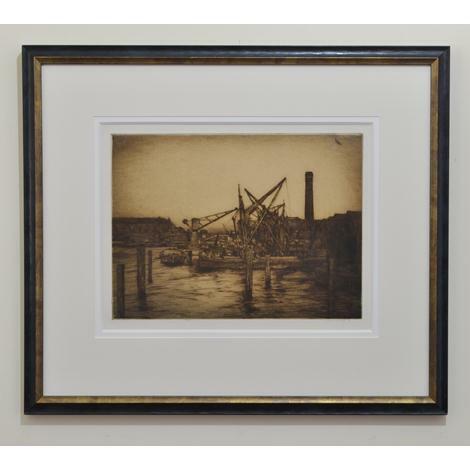 In the first half of the 1880s, the two were often working, side by side, on etchings and dry points and both doubtless benefited from their exchange of ideas. In 1889, Menpes published his first collection of etchings of the Thames, The Grey River, Whistlerian in style and mainly of the shipping and trade, as well as quieter reaches, on the River. It was a theme he returned to in later years. His style became bolder and he experimented with larger plates and different inks - as in this dramatic and evocative sepia print. This image is included in the 1995 catalogue of Sotheby's sale, The Prints of Mortimer Menpes, No.323.